This chili-infused honey is just the thing to give any meal a punch of heat and mouth-watering flavor. Delicious when drizzled over buttery biscuits, into a tantalizing Mexican hot chocolate, or even sprinkled on slices of margherita pizza, this chili-infused honey is just the thing to give any meal a punch of heat and mouth-watering flavor. Each tangy amber treat is handmade by Casey Elsass and Morgen Newman with raw honey from independent beekeepers in the Hudson Valley and a special combination of chili peppers. The duo infuse the honey by hand to create a balanced spice, one that will delight and surprise your taste buds, all without scorching your palate. Handmade in Brooklyn, New York. This is the best honey ever!!! I put some on a slice of pizza and it was game changing! We will forsure be back to get some more!!! I never would have thought this would be something I was missing in my life. I can't believe it's not sold in stores all over the country! 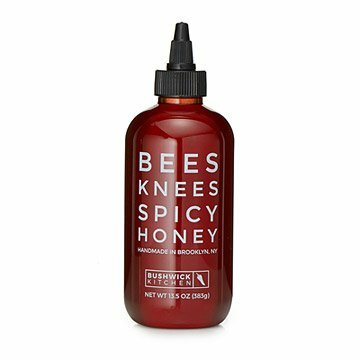 Spicy honey can literally be put on anything you think of and it will give you that perfect little kick to spice things up. I've tried putting it on my breakfast bagels, my roasted plantain chips and even my pizza for lunch (it sounds wild but you just gotta give it chance, you'll know what I'm talking about once you try). One thing I did notice was that the bottle size was a lot smaller than I had anticipated, but in all honesty, this stuff is too good that I can get past the price for the size. It's so unique. Who ever thought of mixing honey with cyan pepper? Well Uncommon Goods did and it's a good thing! I just used it in my cold remedy concoction of hot water, spicy honey, fresh ginger and 1 cinnamon stick. Oh boy! My whole family loves it. Just the right amount of spice and it's great on everything from wings to a cup of tea. Keep those bees busy. As a gift, it was greatly appreciated. As a honey it's really good! I was looking for the "spicy" as the name implied. Major spice would not have been necessary but a little more to distinguish itself! Excellent honey though! So yummy with great spicy bite! This honey is fantastic. Use it in everything you've ever used honey in before for a brand new kick! It's spicy, but just enough...not too much. It's fun trying it on old favorites and finding a renewed love! I love this honey! It has a nice, spicy kick to it, and a good flavor. We have been mixing it into recipes where we use regular honey (half and half), and it adds a great kick and extra dimension of flavor. I will definitely have to buy more. Delicious and unique, perfect for a gift!